As curators we have a tendency to focus on the artwork, the finished product; however this is only ever part of the equation. 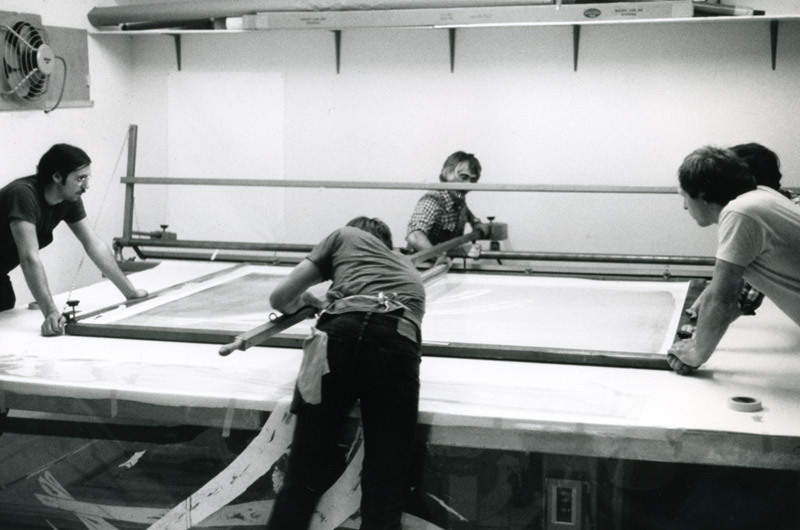 The technical nature of printmaking often necessitates collaboration and team work in order to successfully execute a print. Indeed, the prodigious output of the Tyler workshops was reliant on the efforts of a dedicated and hard-working team of talented printers and staff, a fact which we have endeavoured to reflect on the Team page of our website. 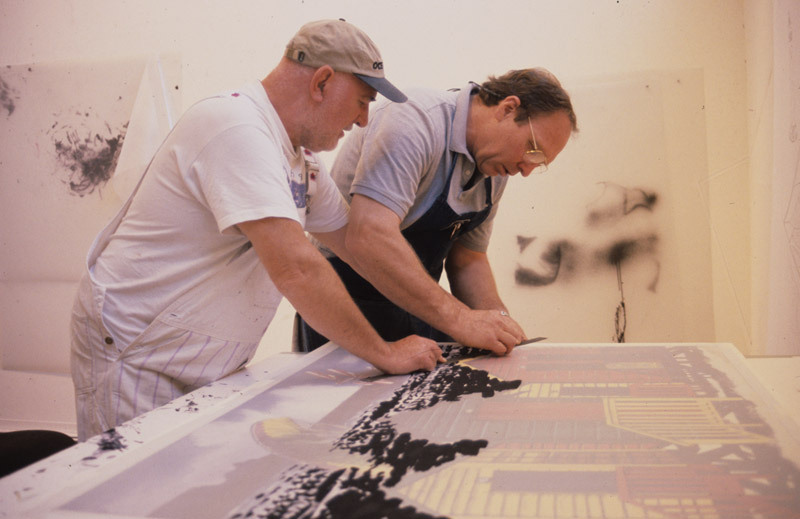 The page features interviews with former staff, through which audiences can gain a greater understanding of the people and atmosphere of the workshops, enriching our understanding of a significant period in the history of printmaking. Over the coming months we will present excerpts from these interviews here on the blog. 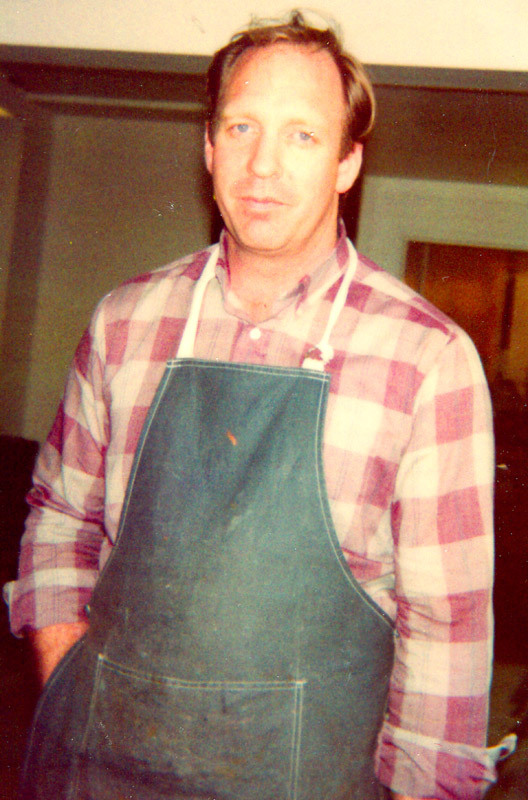 Let’s start with John Hutcheson, an invaluable member of the TGL team for over 16 years (1975-1978; 1987-2001). 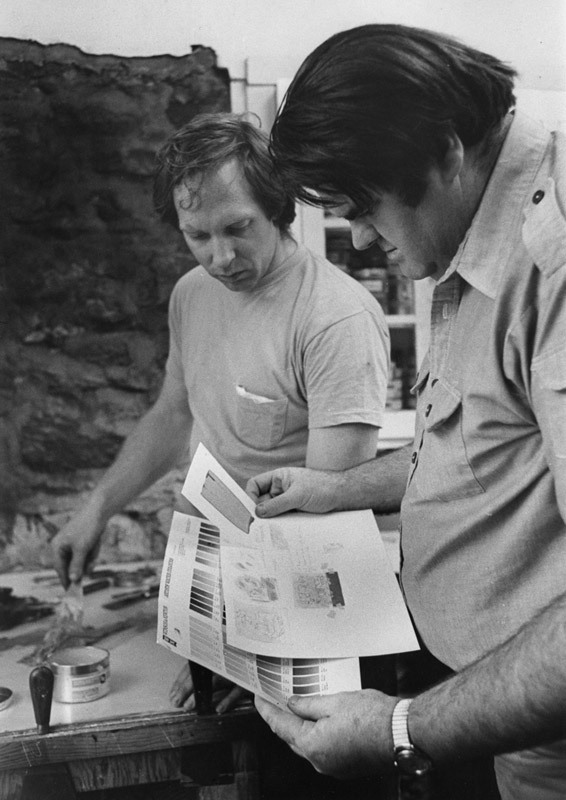 As workshop manager, printer and papermaker, Hutcheson was Ken Tyler’s right-hand-man in matters of research and devising innovative solutions to realise ambitious projects. What was your role at the workshop, and can you tell us a little bit about what that role entailed? My title was Workshop Manager during the last five years or more of the Tyler Graphics workshop in Mt. Kisco. At the same time while managing the production efforts, I was also one of the team of printers and papermakers. 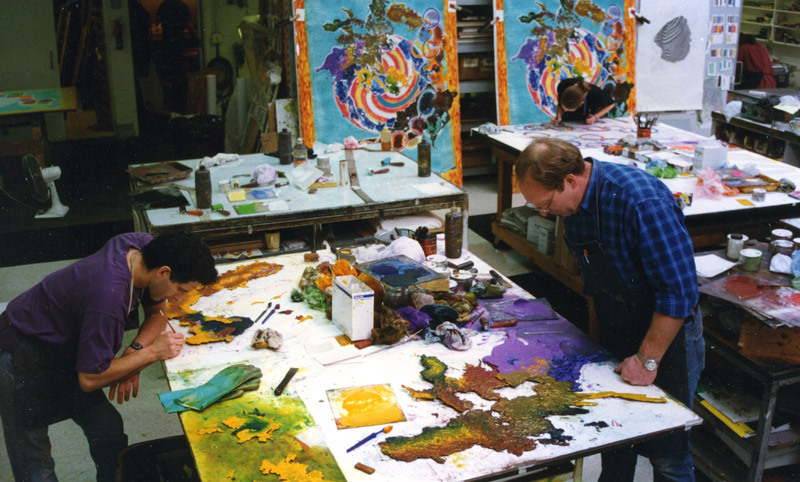 When Ken sent the operation to Singapore in 2000 I went there for three years as the Master Printer/Workshop Manager. I am a Tamarind Master Printer in Stone Litho. Plus I have about 40 years of experience in all of the traditional printmaking media as well as hand papermaking and am one of the best in the use of Indirect (Offset) Litho for artist’s work. At TGL my role was to support Ken’s creative printmaking by ensuring that we always had the necessary materials, manpower, and machinery no matter what new direction he took. One of the hallmarks of Ken’s collaborations with famous artists was his technological developments and his attitude of ‘thinking large.’ He was continually re-inventing the traditional methods and offering his new, improved version to his artists. This meant that we were constantly re-working our machines and searching for exotic materials to support Ken’s vision. Although everybody got involved in the innovations, I was Ken’s main ‘go to’ guy in the workshop for that research. And, once we had a new technique running smoothly enough, I would re-join the team to use the new method to make the editions of prints. It was rare for any printer to work alone all the way through a project. About one third of the days we had VIP guests in the shop and I would help host them. If an artist was in residence or a team of film-makers was at work, I would race around behind the scenes to ensure that everything went smoothly. It takes a great deal of ahead-of-time prep mixed with inspired ad-libbing to make this heroic printing work look effortless in front of the cameras. Ken is a master at entertaining the world-famous guests even while he is inking and pulling the most brilliant prints right there in front of them. We did all we could to assist him during those magic moments. By this time in my career I had worked with Ken and with most of his artists for decades both at Ken’s shops and at other ateliers. Everybody was doing things never seen before. And, because of Ken’s high profile in the art world, we were in the spotlight all the time. Famous artists, curators, and collectors were hanging around. It was pressurized and satisfying beyond compare. I had the best printing job in the world. Can you tell us about the atmosphere in the studio? What did you enjoy most about working there? We were always shooting for the stars. Ken led us in that with his relentless drive. But each individual printer had also made their own personal commitment to seek perfection in their printing and papermaking. It could get pretty intense with each person’s expertise and ethics involved. At the same time we had to remain open to accept direction from the artist and from Ken. 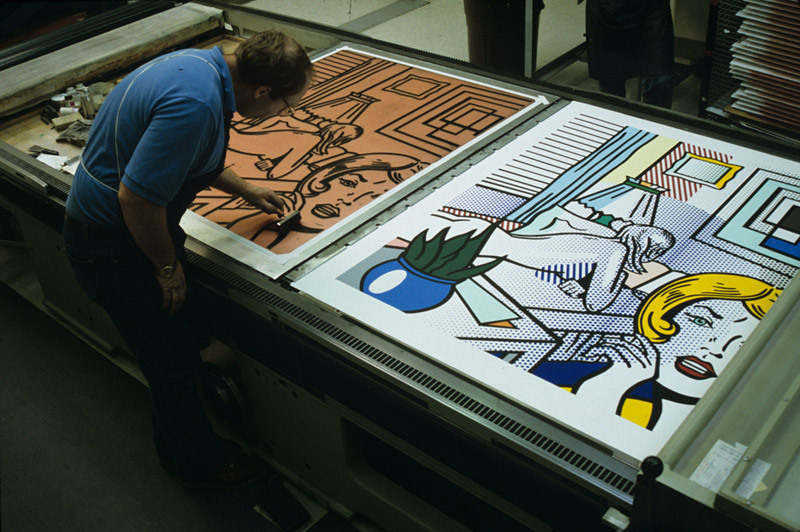 No matter how much any printer knows his or her technique, we still have to serve the art’s needs. 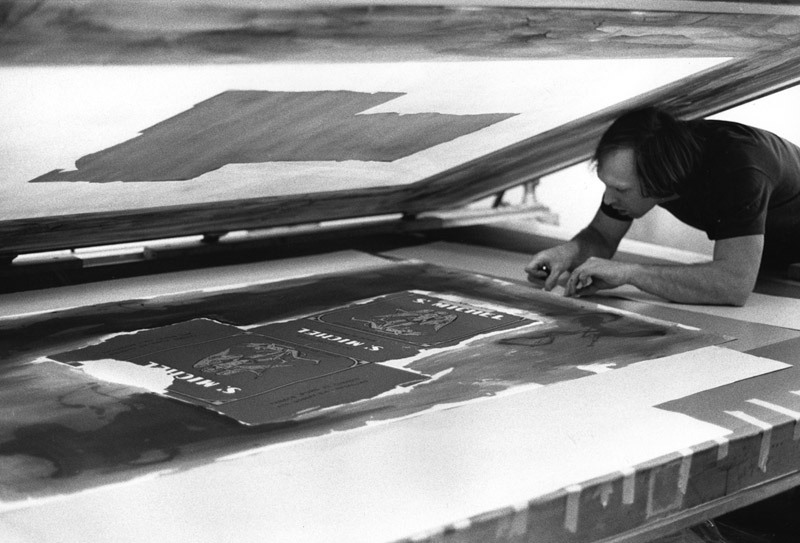 What I enjoyed the most was working at the highest level in the world of prints. Because Ken invited artists from the ‘top ten’ tier worldwide, the finances justified a feeling of unlimited commitment of time and materials. Within that ‘sky’s the limit’ theme, Ken ran a tight and efficient operation. But it still was the most inspiring and well-supported atmosphere that any creative printer could ever hope for. Do you still work in the arts? How did your time with TGL affect your career path? 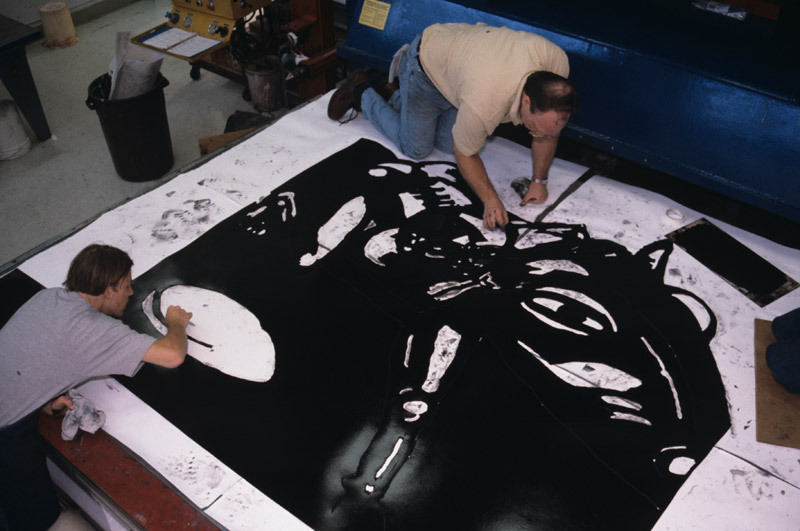 Now I am teaching Printmaking at the college level at the University of North Florida. It is the perfect time and place for me to hand over some of my collected experience and knowledge to the next generation. My time at TGL was my career path. Who could have imagined a better life as a printer? My Dad instilled the love of the craft of fine printing in me. And I was able to follow that trail all over the world and to practice it with the absolute best artists and printers who also love their craft. Do you have a favourite project from TGL, or did you have a particularly memorable experience with a specific artist? Can you explain what made that project or person so special? My early projects with Frank Stella are probably my favourites. It was my earliest opportunity to really test my printing skills against the world. Over the following decades I was able to work on many Stella print projects in several different shop locations. Stella continues to be my favourite. But during those first few years at Tyler Workshop we also did thrilling projects with Oldenburg, Kelly, Frankenthaler, Lichtenstein, Noland, and Hockney. This was the Big Time stage and I was young and ambitious. This was the reason I had left home to dedicate my life to printing. In addition to working in an inspiring group of pioneer-printers I was also collaborating with the young and charismatic Ken Tyler for the young and famous Frank Stella. 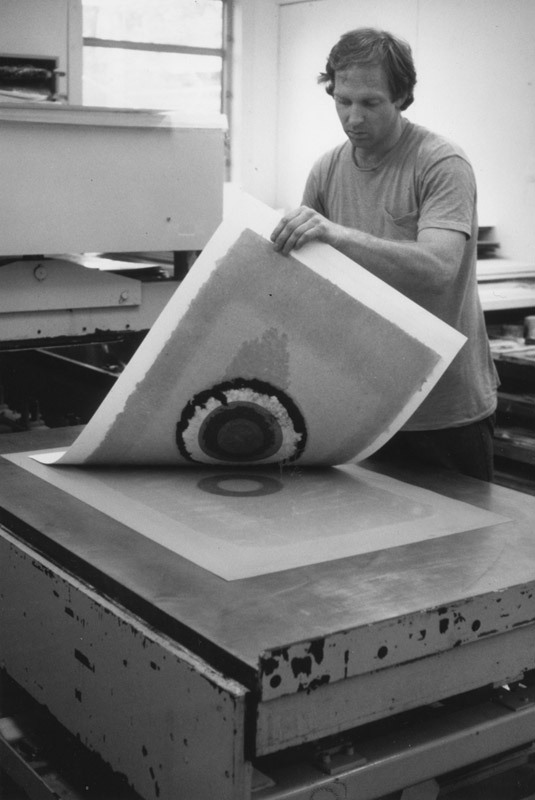 Ken led Frank and the team of printers to use traditional old methods but to use them in a brand-new way. Ken was breaking new ground technically and also philosophically. My ability to ad-lib with exotic methods and to respond quickly to Ken’s and Frank’s ground-breaking ideas was essential. I loved being a vital part of such important art. We were flying by the seat of our pants and it worked! Can you share your favourite memory of the workshop with us? In the midst of our high-profile artist’s projects, Ken was still redesigning and rebuilding the physical plant. He kept a complete crew of builders, electricians, and plumbers on full-time retainer. It was a workshop building under constant revision. On a Fall day one of the most admired New York dealers arrived and parked in their usual spot. We could see them through the multi-paned windows. This art world hotshot smoothed his elegant hair, shot his shirt-cuffs and strode up to the front door. But there was no door. It had been moved to a different location. There followed an embarrassing scramble outside with the dealer running back and forth on the porch trying to prove that he was a familiar friend and the door must be here somewhere. It had been there last week. Finally we helped the rattled dealer in through the back. But the inside arrangement of rooms and openings had also been changed so that this poor dealer never did regain a sense of belonging.